Add all the dressing ingredients in a blender and blend until dressing is smooth. Set aside and chill in the refrigerator. Wash and rinse the quinoa in a strainer until cold water until water runs clear. Bring coconut milk, vegetable stock, and salt to a boil in a medium saucepan. Add the quinoa, return to a boil, and reduce heat to simmer for 20 minutes until the liquid is absorbed. Cover and remove from heat. Set aside. Dice the tofu into big cubes and pan fry in coconut oil until golden brown on all sides. Set aside. Cook the broccoli and carrots per instructions given in Oven Roasted Vegetables. 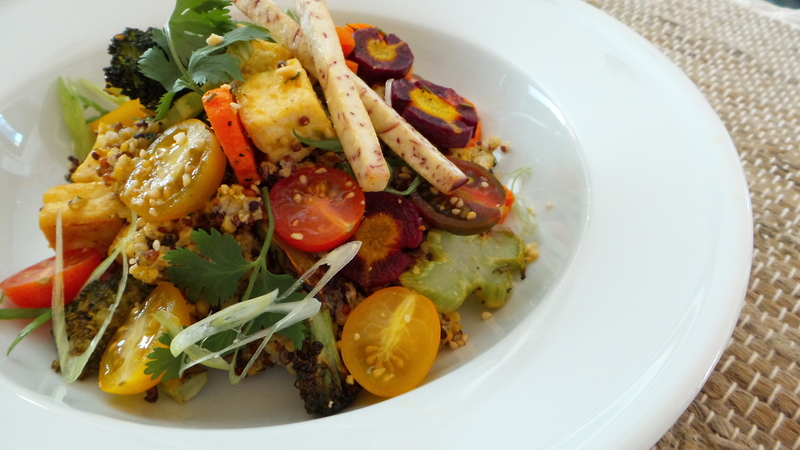 When ready to serve, scoop desired amount of quinoa, dressing, tofu, and roasted vegetables into a mixing bowl. Toss until content is evenly coated with dressing. Garnish with cherry tomatoes, cilantro, ground peanuts and taro sticks.